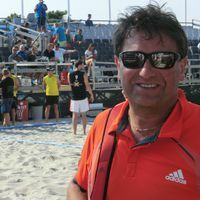 At the 2012 EHF Congress, Norwegian Ole Jørstad was elected chairman of the EHF Beach Handball Commission. Coming now into his first European Championship as the commission’s new chair, he talks to eurohandball.com about the upcoming final tournament in Randers (9 to 14 July), the commission’s plans to further develop the sport and to increase its popularity. Mr. Jørstad, the Men’s 19 and Women’s 19 European Beach Handball Championships have just come to an end. What was your impression of this prelude to the senior national teams’ tournament? Ole Jørstad: The technical and tactical standard of the players has been great. We have seen those youngster doing fantastic spins shots and fly-in goals, they have shown great tactical knowledge in attack and defence, so we were really impressed by the level of this championship. And what’s your opinion on the surroundings? The centre court was jam-packed for the Women’s 19 final between Denmark and Hungary. Jørstad: I talked to the organisers and they think that 1,600 to 1,700 spectators attended the women’s final. We have never seen so many spectators outdoor for a younger age category tournament. This is for sure a European record. What does this make you expect for the senior national teams European Championships which throw off on 9 July? Jørstad: I’m very positive that the quality of the players and the game will have improved. And when it comes to the spectators I am convinced that we will run out of seats, especially should one of the Danish team reach the finals. From the chairman of the EHF Beach Handball Commission's point of view, where does the sport stand at the moment? Jørstad: The popularity is increasing, but we are still in an early phase of further developing the sport. We have teams from a dozen nations coming to Randers, but there are 49 within the EHF. So we have a tough challenge ahead to bring the next nations into beach handball. Where would you like to take the sport to, say in the next 5 to 10 years? Jørstad: If we succeed within the next three years to bring in more than 50 per cent of the EHF’s member federations into beach handball, it would be a great start. In ten years we should have at least 80 per cent of the federations play beach handball. What are the steps the EHF Beach Handball Commission aims to take to achieve this aim? Jørstad: We are now focusing on the club competitions, raising the standard of the European Beach Tour. If we succeed in our goal that more and more club teams in more and more countries play beach handball, it will have a positive effect on building national teams in the same countries. Therefore next year we are planning to introduce the Champions Cup. The idea is to invite the national champions from all countries to Spain to compete. And we hope that these two events, the Champions Cup and the ebt will make it attractive for federations to sign up for the European Championships. This is one of the short term goals we are working on. Which teams do you see in the favourites’ role at the European Championships in Randers? Jørstad: I think we will see good teams from Hungary again and also good teams from Croatia. I am sure that the hosts from Denmark will come very well prepared. It will be exciting to see what the Danish team with Hans Lindberg will be capable of. Spain, of course, will come with a good men’s team. And maybe there will be some surprise packages. We certainly hope so. But either way, it will be a fantastic championship. What does it mean for beach handball to have such an ambassador? Jørstad: For us, Hans Lindberg playing beach handball in Denmark is a fantastic thing. I am sure that there will be a good number of journalists focusing on him. It is great marketing for beach handball. But the most important is the signal it sends to other players in Europe: that playing indoor and on the beach can be a good combination. This signal he sends to the player and the coaches all across Europe is fantastic.